Jackie Barnard is an artist and an architect. He draws lines. Some call his drawings art. He calls them doodles. He says it is exciting, a thrill, a great stress reliever. Drawing is his passion. He started drawing with crayons when he was about five. His mother encouraged him…but to draw on paper…NOT her freshly painted white walls. In school his favorite classes were Art and Drafting. 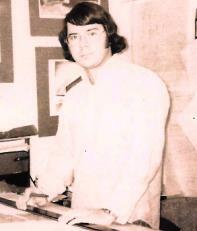 Teachers encouraged him to pursue architecture as a career. After graduation from Texas Tech School of Architecture, Lubbock Texas, where he was known as “The Doodler”, he doodled on calendars and notepads while talking with clients and sales reps. Even today, at conferences, conventions, on planes, on a cruise, while waiting for his doctor, he doodles. Some of his doodles are for stress relief. Others are the start of a new project. 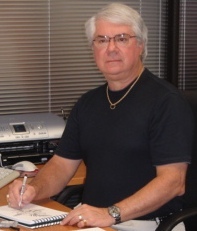 He specializes in commercial and industrial projects like car dealerships, banks, office warehouses and retail centers in his architectural practice. Numerous doodles of his hang in clients’ offices. To the right you will see two pictures. The top one is Jackie as a hard-working architectural student, and the lower one is the artist at his board, still drawing - by hand, as is his desire - offices, dealerships, residences and other artwork in the classical fashion, with pen, pencil and paper.